North Eastern Security Force, LLC Respects each user’s privacy and will not sell or lend any information to a third party, unless requested By the VA Department of Criminal Justice Services, Law Enforcement or a legitimate governmental request. North Eastern Security Force, LLC is licensed by the VA Department of Criminal Justice Services. Any and all suspicious activity will be reported to the proper authorities and the VA Department of Criminal Justice Services. Our DCJS Licence Number is: 11-6371 . If you have any questions, You may contact us at (888) 552-4380 or email us at Info@nesf.us . Refunds are applied to unused service hours pre-paid, Unused service hours can also be credited to a future invoice. All satisfactory services completed are non-refundable. This web site is only to be used a method of communication between clients, employees and North Eastern Security Force, LLC. North Eastern Security Force, LLC may at times send informational newsletters and promotions directly from North Eastern Security Force, LLC to clients. North Eastern Security Force, LLC is licensed by the VA Department of Criminal Justice Services. Any and all suspicious activity will be reported to the proper authorities and the VA Department of Criminal Justice Services. Our DCJS Licence Number is: 11-6371 . 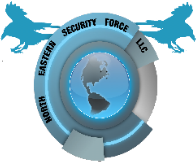 All logos, images, pictures, trademarks, names, documents, slogans are owned and copyrighted by North Eastern Security Force, LLC. Users may not use any website material without expressed written permission from North Eastern Security Force, LLC. If you have any questions, You may contact us at (888) 552-4380 or email us at Info@nesf.us . The webmaster of this website is Ahmad J. Elbarmil the President & CEO of North Eastern Security Force, LLC who has sole ownership and control of the company and the web site.